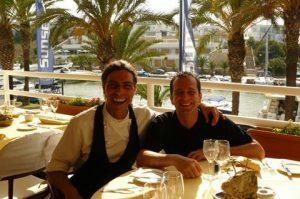 Giovanni and Antonio are the managers of La Scala. After many years of sacrifice, love and complete dedication, they finally accomplished their dreams of being completely in charge of the restaurant and becoming nowadays the owner of La Scala. The sincere friendship, wich has always united them, has been expressed in complicity and trust wich allows them to enjoy their job, creating a homely and confortable working environment regarding their staff. Both have worked in various parts of the world including, of course, in Italy. Giovanni, an expert on wines, is an excellent advisor at the time of your choice, plus a friendly and professional waiter, making dinner a beautiful memory for all customers. Antonio, with his love of the kitchen, spends most of his holidays period improving his experience and his culinary knowledge colaborating with other famous restaurants in their cuisine in order to provide La Scala with innovations and creativity, without losing its origin essence. Together, they learned fom the daily experience and from the great masters, from wich they have adopted three basic pilars: the frequent use of the season and area’s produce, the use of a careful, professional and excellent technique, with a full knowledge of culinary bases, and a thorough investigation, which as well as creating dishes it seeks to get them into a “raison d’être”, not just mixing ingredients for itself but trying to give them a real sense.